You might have observed that social media has been a terrific medium of customer support for several enterprises. A few days back there was an article in Telecomtalk regarding BSNL’s endeavor to enhance the social media experience of its users. But for those who have interacted with BSNL through its social media handles the one gut feeling that they get is whether they are dealing with bots or dumba$$es because of the quality of gibberish scribbling we get from them. I have had these escalated to BSNL Pg Cell via CpGrams vide DOTEL/E/2016/39805 and on 7th November a response (acknowledgement) was obtained from them assuring to resolve the anomalies presented by their social media team. I would bring to your kind attention that the BSNL Social Media Team needs to have radical renaissance in tune with the corporate objectives. Currently each division has their own @twitter handles and most of them are not verified. If you compare your rivals like @RelianceJio, @JioCare, @Airtel_Presence, @VodafoneIn, @IdeaCares, @IdeaCellular, @RelianceMobile they all have one or utmost two (one for presence, one for support handling) and both are verified accounts. Internally they take the responsibility to dispatch to the appropriate calling circle. For example I have sending request a few months to @VodafoneIn and when I was i KA, Karnataka circle used to service me. Now I had NMNPed to Chennai, their tamilnadu circle services the request (from Coimbatore). And for tweets you do not need salutations like Sir/Madam. Also please etc can be removed. Because you have only 140 characters and the message alone needs to take priority. Social Media teams should remember one thing that these are not private docket e request/response but the content is indexed by search engines and visible throughout the world by everyone. It is not only the enterprise image but the image of the country that is also impacted by the response. This book should be a good start for your social media entrepreneurs: Social Media Marketing by Dan Zarrella. The ELCOT entrance near Sozhinganallur witnesses a huge surge of traffic particularly during peak hours. And evenings the situation is beyond normal imagination. Crossing the stretch is almost next to impossible. On both sides of the road, the autos and share autos park themselves hap hazard looking and howling for customers. Adding to the woes the two wheelers and cars that exit Elcot complex do not care about signals and/or pedestrians. They just dart out at their own whims and fancies. A report has been submitted to Chennai Corporation vide complaint number 549AKI on 9th November. The above issue has been reposted to Government of Tamil Nadu vide CpGrams (GOVTN/E/2016/02773) for delegation to appropriate teams on 29th November 2016. Another complaint has also been filed vide 193JJI requesting for a pedestrian subway or mini makeshift flyover for the benefit of pedestrians. The request and response of this petition is reproduced below. You may be aware that a few years back (in 2013), Department of Telecommunications brought in a regulation that at any point of time an individual can hold only nine connections in India. However this magic figure of 9 is often mis-interpreted by service providers. Also the process of checking the number of connections by the individual is not defined clearly. Hence this writer has taken the onus of escalating the following report to the Office of Prime Minister vide PMOPG/E/2016/0397737. A couple of years back DoT has brought out a regulation that at any point of time an individual Indian citizen should not hold more than 9 telephone connections on his name. 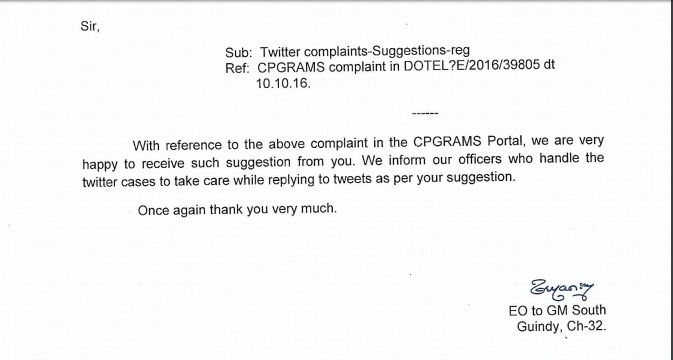 However there are several things which are unclear and raising a CpGrams to DoT keeps shunting the request from pillar to post and just getting closed without a tangible response. We would hence request you to kindly help with the same. Does the total number of connections include only mobile number or mobile and landline numbers? Does the total number of connections are per telecom license area or pan-India? A few years before MNP regime I might have had connections in the region and discarded use of that number. Would they start ticking in my name still? Where and how do we request for a list of total number of connections in our name (pan-India). Individual cell phone companies like AVoID cartel (Airtel Vodafone Idea cartel) they say they don’t have this facility. I have tried requesting to DoT and the request went to BSNL Ahmedabad and they asked me to file a RTI to DoT. I have requested information to DoT on the address to which send the RTI petition and documents that are needed. I am also concerned in sending the identity documents because RTI is a publicly available copy. Hitherto there hasn’t been any response from DoT yet. Signal quality is very bad and you can see ghost lines almost in every channel. Many sections of TRAI recommendations outlined in http://trai.gov.in/Content/faq_subcat_details/161_2_1.aspxD_350 are violated by TCCL as indicated below. The contact number of the call center is not advertised prominently in their website. Only after calling repeatedly at their corporate (toll) number we are getting the call center number from them. TCCL does not have a web-based complaint monitoring system. There is no Nodal/Appellate team at TCCL. The MSO keeps changing the composition of the package adhoc and channel numbers keep changing rapidly. The MSO had de-screened channels without giving a proper announcement. The complaints had been remaining unaddressed for several weeks now.